As has been my tradition the last few years, I try to buy at least one new Christmas album for the holiday season. 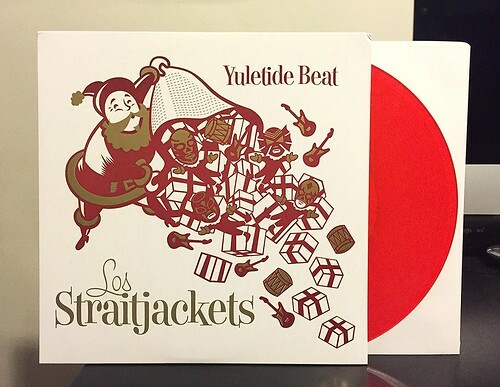 After last year's discovery of Los Straitjackets, I've been keeping an eye out for their other Christmas album, Yuletide Beat. Thanks to eBay and a record seller in Germany I was able to add it to the collection this year. At $25 shipped, it was a little more costly than a typical record purchase, but considering it's been out of print for a few years, I was happy to grab it when it came up. Like The Ventures before them, Los Straitjackets have arranged some traditional Christmas carols into surf inspired rock songs. While they never quite capture the same kind of magic that The Ventures were able to harness, it's still a strong collection. Opening track "Deck The Halls" is probably the highlight of the bunch, with a upbeat rocking version of the song. Another standout is the horn tinged rendition of "Joy To The World." It puts some real soul into a song that's often times something of a downer. In comparison to their first Christmas Album "Tis The Season for Los Straitjackets," the song selection isn't as good for my personal tastes. That album focused more on upbeat songs of the season, while Yuletide Beat has an awful lot of more religious type songs. Granted, make them instrumental and rocking and they're still pretty good, but I just prefer my Christmas music to be about snow, candy and Santa Claus. Regardless, it's a great pick up if you like Christmas music, but still have the need to rock out a bit during this time of the year.